← SanDisk Memory Vault USB Hard Drive: Built to Last? Corsair recently revealed their newest USB 3.0 version of the Flash Voyager GT, Flash Voyager and Flash Survivor. With smaller, sleeker and more durable shells, these flash drives are faster than ever. Not only are the drives compatible with Windows, Mac OS X and Linux but they are compatible with USB 2.0 as well. The Flash Voyager GT can now transfer data up to four times the speed than the USB 2.0 and up to two times the speed of standard USB 3.0 drives currently on the market. The Flash Voyager GT 64GB model has a read speed of 135MB per second and a write speed of 83MB per second. With such incredible speed and high memory capacity, it is no surprise that any fast-paced business professional would be packing this drive in a holster on their hip and ready to go. Corsair flash drives are widely known for their ruggedness and durability and the Flash Survivor is, without a doubt, no exception. Living up to its name now more than ever, this drive can keep up with even the most adventurous outdoorsman. Donning a water resistant anodized aluminum shell, this drive is said to survive up to a 200-meter water submersion. When it comes to efficiency, functionality and economically friendly drives, the Flash Voyager just might be the answer. Though it may have slower reads and writes than the Flash Voyager GT, this drive is perfect for any student or small business owner. Available in 8GB and 16GB memory capacities, the Flash Voyager could be considered the most versatile drive in Corsair’s USB 3.0 flash drive collection. Though, Corsair’s new line of flash drives have gained more positive reviews than negative, there is one common concern. Will Corsair come out with a Flash Voyager GT model smaller than 32GB? 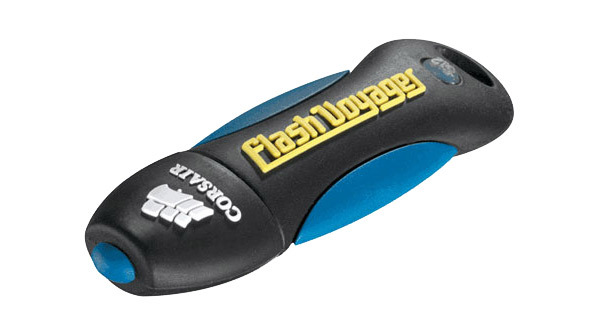 The Flash Voyager GT is available in 32GB memory capacity for $59 and 64GB capacity for $129. The 8GB Flash Survivor can be purchased for $28 and $35 for the 16GB version. Finally, any college student can purchase a 8GB Flash Voyager for $17 and a 16GB drive for $24. So, whether you’re are a hot shot executive, an adventure-seeking traveler or a sleep-deprived college student, it appears that Corsair has developed the drive for you. Thoughts? Will you be adding a USB 3.0 device to your storage collection? This entry was posted in Corsair, Corsair USB 3.0 Drives, SuperSpeed USB 3.0, USB 3.0, USB 3.0 Flash Drives, USB Devices, USB Flash Drives and tagged Corsair flash drives, Corsair Flash Voyager GT USB 3.0 flash drive, Corsair Releases Latest USB 3.0 Drives, Corsair USB 3.0 Drives, Flash Survivor, Flash Voyager, Flash Voyager GT, USB 3.0 device, USB 3.0 drives. Bookmark the permalink.